← Theresa E. McCormick, Ed.D. 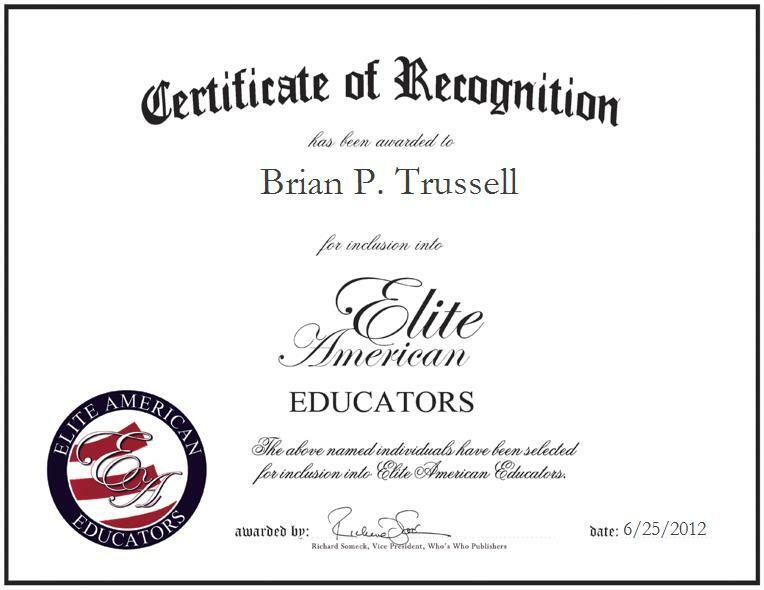 ROSEMOUNT, MN, June 25, 2012, Brian P. Trussell, Chemistry Instructor at Rosemount High School, has been recognized by Elite American Educators for dedication, achievements, and leadership in science instruction at the secondary level. In his current capacity, Mr. Trussell teaches honors and Advanced Placement chemistry to high school juniors and seniors. He also coaches football and serves as the strength and conditioning coach at Rosemount High School. Mr. Trussell works on a year-round basis, and spends his summers finding new, innovative and beneficial ways to help each and every student that he works with. Mr. Trussell originally planned to attend medical school after being accepted, but made the decision to work in education after earning a master’s degree in secondary instruction from Saint Mary’s University of Minnesota and working as a research associate for the United States Food and Drug Administration for a year. He specializes in science class room instruction and the education of gifted and talented students, and also holds a Bachelor’s Degree in Biology with a minor in History, earned from Gustavis Adolphus University. In looking ahead, Mr. Trussell looks forward to getting married, and to planning on completing his Ph.D. before turning 30 years old. Mr. Trussell recently became a strong man competitor, and he contends in amateur strongman competitions. He is also a USATF official and he enjoys powerlifting.